Maritzburg United General Manager Quintin Jettoo provides us with the latest club news ahead of next week’s resumption of league action. United are back in action on Tuesday 10 February 2014 when they take on Bidvest Wits at the Harry Gwala Stadium (19H30 kick off). For the most part, Maritzburg have had a quiet transfer window period, looking rather to build on the solid foundation laid during the first half of the season. Bongolethu Jayiya: We would have liked to have brought in Jayiya, but unfortunately during a medical, we discovered he had taken a knock that would have kept him out for eight weeks. Eight weeks is a significant portion of the second half of the season, and as such it did not make sense to sign him. Menzi Chilli (centre-mid) and Veluyeke Zulu (centre-back): We have allowed the two players to join NFD side Royal Eagles on loan, where we hope they can get more game-time. 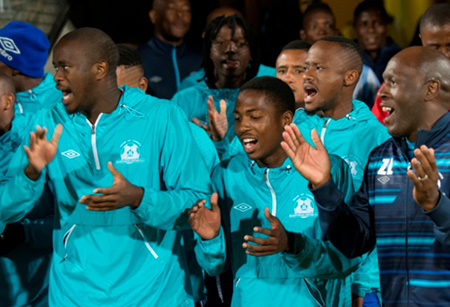 They are still part of Maritzburg’s future plans, but were not getting game-time during the first half of the season. Morgan van Rooyen: We have given Morgan his clearance. Otherwise we have decided to place our trust in the squad we have – sometimes clubs buy players in the transfer window just for the sake of it – desperation buys. We are happy with the squad we have and everyone is fit and available for next week’s game. * At the time of publication, Jettoo was not able to provide confirmation on Mohamed Awal’s status – this will be updated later in the week.